Rhubarb was discovered in China nearly 5,000 years ago. In Marco Polo’s stories of his travels to China, he mentions rhubarb which the Chinese used for medicinal purposes. Rhubarb was used for centuries as a gentle laxative, and to reduce fevers. It was also used to clean pots and dye hair. Rhubarb has thick, celery-like stalks which belongs to the buckwheat family. These stalks can grow up to 2 feet high. The stalks are the only edible part of the rhubarb plant. Rhubarb is generally thought of as a fruit, but it is actually a vegetable. Rhubarb comes in many varieties but it falls into two basic types. The first one is the “hot-house” type and the second one is the “field grown” type. The hot-house type is recognized by its pink to pale red stalks and its yellow-green leaves. The field grown rhubarb has much more flavour and has cherry red stalks with large green leaves. Rhubarb has an intense tart flavour to which a lot of sugar is added. Rhubarb delivers vitamin A. It is low in calories and carbohydrates which makes it a great snack for dieters. 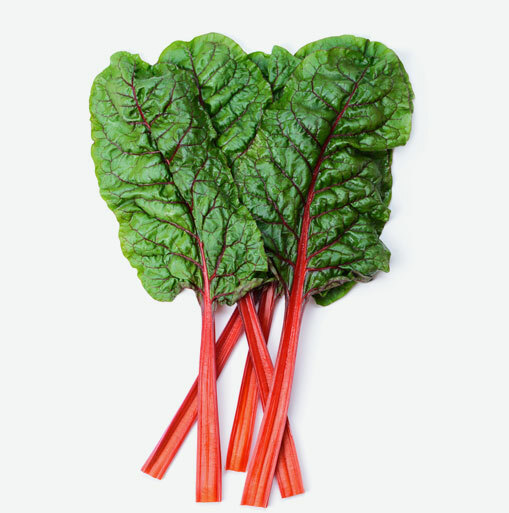 Rhubarb delivers a good does of vitamin C and potassium which are beneficial for heart health. Rhubarb is low in sodium which benefits those that are on sodium restricted diets. Select crisp well-coloured stalks. Avoid wilted and oversized stalks which tend to be woody and dry. Fresh rhubarb is quite perishable, so be sure to refrigerate and use it within three days. The rhubarb leaves should be fresh-looking and free of blemishes or spots. Wash the rhubarb and remove the leaves just before using. Rhubarb can also be frozen. To freeze, choose tender stalks with few fibers. Wash, trim and cut into desired lengths. Rhubarb may be frozen from the raw state, but if you want to retain its colour and flavour, blanch it by heating the rhubarb in boiling water for one minute. Cool quickly under cold running water and pack it in zip lock bags. Rhubarb makes delicious, mouth-watering sauces, jams and desserts. In some regions of the world, rhubarb is known as the “pie plant” because of its popularity for that purpose. In North America, a traditional flavour combination is rhubarb and strawberries; in Britain, rhubarb and ginger is widely used. Rhubarb is more than just an ingredient for making pies. The celery-like vegetable is showing up in soups, stews and other savoury dishes where its natural sourness jazzes up many dishes. Restaurants serve foie gras with rhubarb puree. Game such as duck, venison, and wild boar are often paired with rhubarb, as these stronger-tasting meats can stand up to the tartness. To prepare, remove any remaining leaves or portions of leaves. Cut off either end of the stalks, which tend to dry out, wash in cold water and chop. If stringy, the stalks can be peeled — but beware red juices, which can stain.